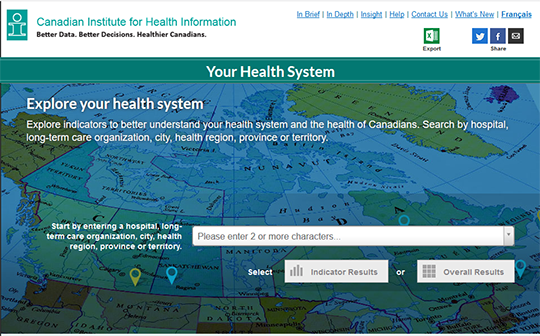 An interactive web tool providing Canadians with current results for key indicators for acute care hospitals, long-term care facilities and health regions. Provides information on facilities performance in relation to quality of care and patient safety, as well as pricing information on cost of hospital stay. The tool allows consumers to search by hospital, long-term care organization, city, health region, province or territory. Consumers can compare results for hospitals, long-term care organizations and health regions with those of others and change over time.